Your mother was right: breakfast really is the most important meal of the day! Not only does it give you energy to start a new day, but breakfast is linked to many health benefits, including weight control and improved performance. A more nutritionally complete diet that is higher in nutrients, vitamins, and minerals. Especially when topped with eggs, tomatoes, avocados, or peanut butter, you can make your morning meal even more fiberful and gain some valuable protein. Improved concentration and performance in the classroom or boardroom. We know how important your daily life is, so there’s no need to take on the day with an empty stomach. It’s significantly easier to get your creative ideas flowing when you’ve had a filling breakfast! More strength and endurance to engage in physical activity. 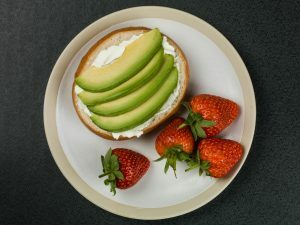 Carbohydrates found in bagels are great at creating long lasting energy, making it a wonderful choice for someone needing energy for the entire day. 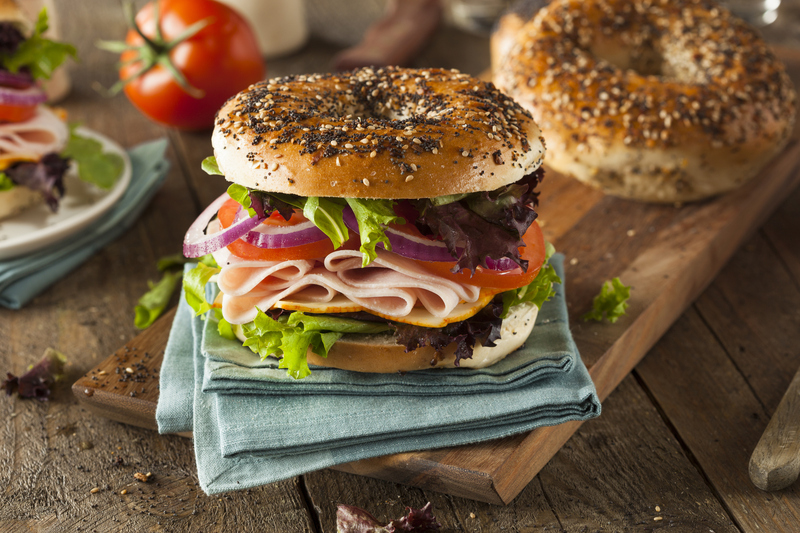 With a plain bagel weighing in at zero milligrams of cholesterol, bagels prove they’re a heart healthy breakfast choice – and great tasting, too! With all of the incredible health benefits a bagel has to offer, why not start including it into your morning routine? Meet someone at the shop to see all that we have to offer, and pick out your new healthy breakfast option. It’s the day after Thanksgiving, and your fridge is full of the classic holiday offerings such as turkey, cranberry sauce and stuffing. But before you wake up in the dark for your Black Friday shopping, you’ll need the necessary fuel to find those awesome deals. Luckily for you, we’ve found the perfect breakfast that utilizes your favorite leftover items. And this recipe will come in close competition to your actual Thanksgiving meal! 1. Place mixed greens on bottom half of toasted bagel. 2. Top with leftover stuffing, turkey slices and cranberry sauce. 3. Sandwich together with other bagel half and serve. Enjoying a bagel toasted to perfection is one of our favorite ways to begin our day. But, have you ever wondered if other countries’ bagels look like America’s, or does each country have its own twist on this amazing breakfast? The answer is yes! While we all know the best bagels come from the Bagel Bakery, followed by New York, here are some examples from other countries. Although New York City is one of the world’s epicenters for great bagels, it certainly is not the only one. Compared to an American bagel, a Montreal-Style bagel will be much smaller and denser. They will also be boiled in water containing honey, making the bagel significantly sweeter. The word “bagel” in Finnish directly translates to “water ring,” showing us that they too boil their bagels before baking them. The main difference between bagels from America and Finland is that Finland’s have larger holes in the middle, making their ring a bit skinnier in comparison. 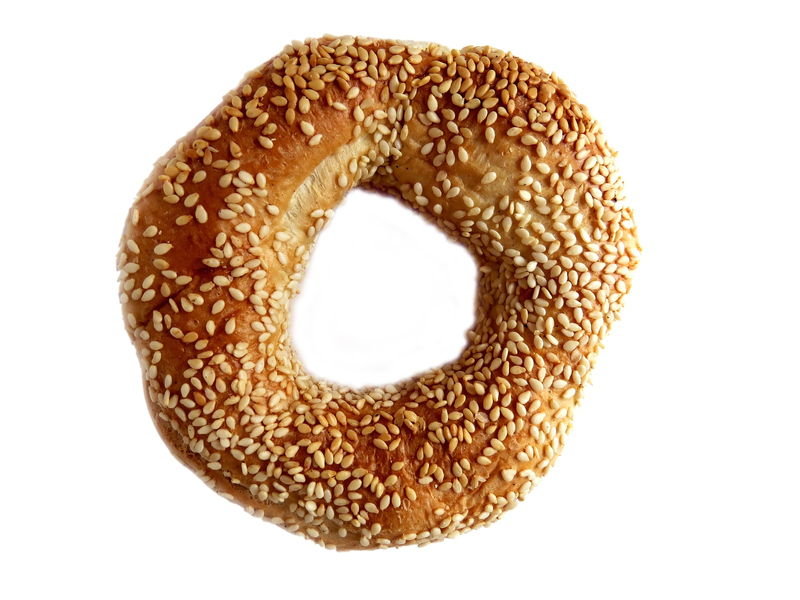 Jerusalem bagels will typically always be topped with sesame seeds, and are not boiled before baking. The best way to eat these bagels is by topping them with za’atar, a common name for a collection of Middle Eastern herbs such as origanum, thymus and satureja. 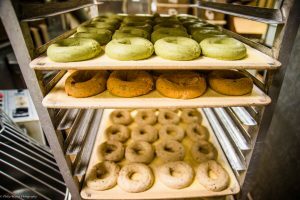 Infusing green tea into popular dishes is a common occurrence in Japanese culture, and their bagels are no exception. A Green Tea bagel from Japan will look similar in size and shape compared to an American bagel, but will have a distinctly different green coloring to them. Russians have a few different versions of ring-shaped breads popular in their country. Sushki, specifically, are classified as a dessert and best paired with a cup of tea. Additionally, Sushki are mildly sweet and only about a fourth of the size of an American bagel. Stay in Your PJ’s for This Cup of Coffee! With each morning getting a bit colder, it seems increasingly more difficult to get out of bed each morning. Knowing how warm and comfy your bed is compared to the low temperatures outside makes your heart break a little each time you have to leave. Sometimes, you even consider using one of your precious sick days to play hooky by staying in bed all day binge watching your favorite show. We get it, especially for those mornings where you only possess enough energy to get up and make a cup of coffee. If that’s the case, why not make sure your first cup coffee in the morning is fresh and high quality? The best way to do this is by stocking up on a pound of beans from The Bagel Bakery. By buying our Rembrandt Coffee in bulk, you can stay in your pajamas while sipping on an amazing cup of joe. 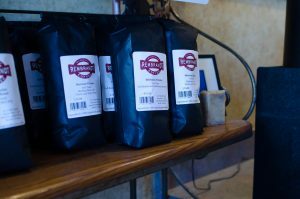 Our coffee is grown by family owned farms in Guatemala, where we personally import from and visit each year. Now when you roll out of bed in the morning, you can know your coffee is fresh tasting and benefiting families in Guatemala, so it’s a win-win! Why does a bagel have a hole in the middle? I’ve had a lot of guests at the Bagel Bakery ask me, “Why does a bagel have a hole in the middle?” They wonder if the hole has an actual purpose, or if it is just one of those things that’s there for no reason. From creating a career out of making bagels, I’ve learned it’s actually a combination of a few different things. The hole in the middle of the bagel allows it to have a larger surface area, making it easier to consistently cook the bagel all the way through. This is important because bagel dough can be incredibly thick, which would make it difficult to know if the center was cooked completely if the hole was not there. Also, this larger surface area allows the bagel to have even more of the chewy crust that we all love so much. We create our signature crust by boiling the bagel for 30-60 seconds before baking it, because if there’s no boil, there’s no real bagel. The outside crust is one of the most defining, and amazing attributes of a bagel, so having a bit more of it is sure to make anyone’s morning better!